A Walk on the Wild-Flower Side! 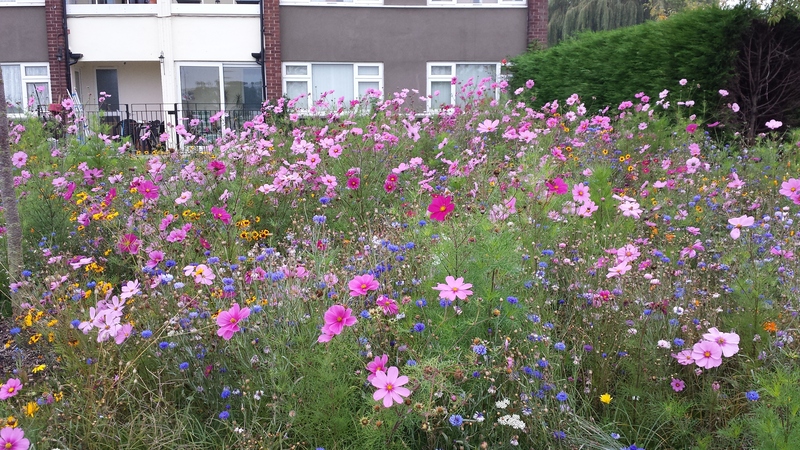 Having recently seen the results of sowing wildflowers around areas of social housing, in parks and along road verges, has made me so much more aware of the enjoyment you can experience by seeing wildflowers . 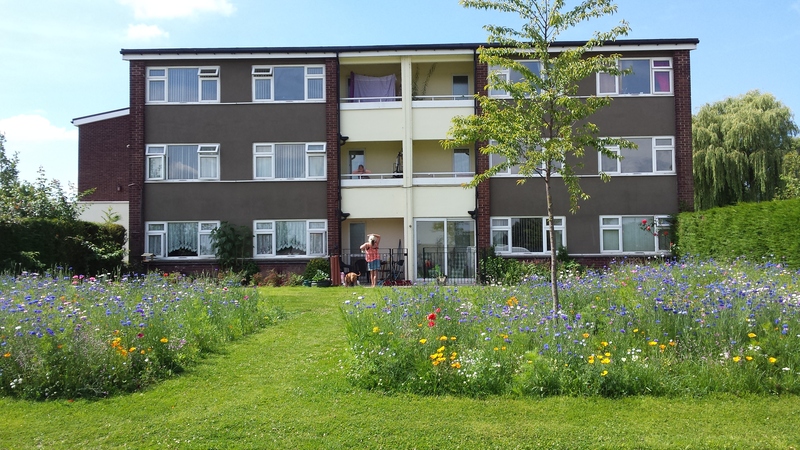 Two of Phoenix Amenity Supplies Ltd landscaping clients have sent us photographs of their social housing projects where they are experimenting with sowing areas of wildflowers – for which we have supplied the seed mixtures. These new projects have created an added interest for the local people and the landscapers too! There is a great sense of achievement and satisfaction I suspect, in watching the wildflowers take hold and develop through the summer. Their photographs stand as a testament to the achievement that the landscapers experience. The change in colours has been fantastic and our wildflowers are now 5ft + high! We had blues in August and now huge pinks. 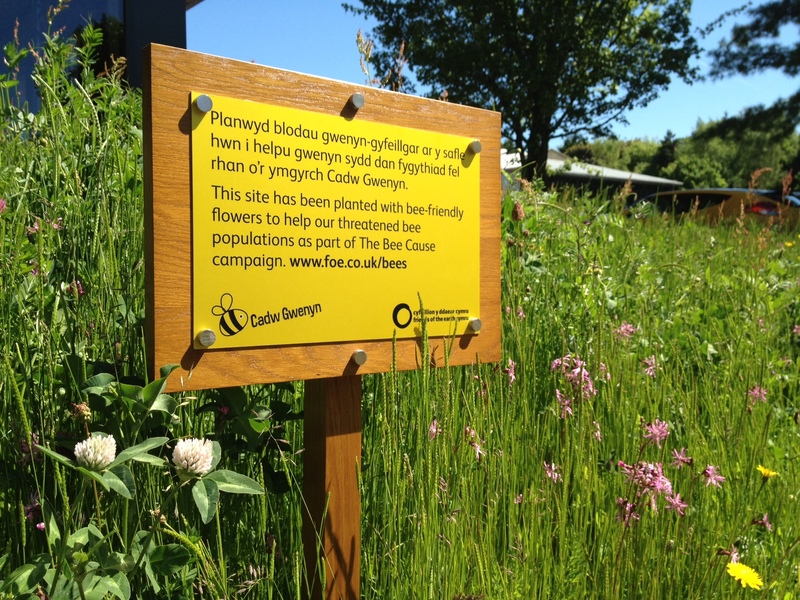 Previously Bron Afon – a community based project – sent us photos of the Bee World Project for which we supplied our Perennial Wildflower Seed Mixture. Their project won an award from Friends of the Earth and it is still ongoing. Now into its’ second year, they told us that they would be adding annuals into the perennial mix they used last year – to create more colour and variety. In my recent experience of the many wildflower projects that local authorities, park authorities and the Highways Agency have created, I can only express my own keenness that these projects should continue to flourish. Worcester City Council has created wildflower areas next to roads, under bridges and alongside car parks, Gloucester highways have been vibrant with colour from wildflowers alongside the road verges. Recently on holiday, I experienced how Sidmouth Town Council has experimented with wildflower areas amongst the usual rows of bedding plants in a high-profile park. The mass of activity the wildflowers have created from pollinators hovering, buzzing and darting in and out – thus making them an even more interesting and lively feature as you walk by. I have noticed that the usual rows of neatly planted bedding plants – bereft of insect activity – began to lose their significance in the park when placed up against the mass of competing wild blooms, which soon began to take prominence once the wildflowers had become established. As Phil Birtle pointed out, the appeal of wildflower beds is that at different times of the season a dominant species of flower takes hold, thus creating a varying and vibrant display as each flower pushes against its’ neighbour for the light and the right to survive. Wildflowers have an urgency about them – the chaos they create among themselves giving them an embodiment of the richness of life which seems far more engrossing to me than many of the plants we cultivate. I am not against cultivated flowers and plants by any means; I have just recently been pleasantly reminded of my own childhood walking through natural meadows, waist high in tall grasses and looking out for native wildflowers. The discovery of a new bloom as the summer progressed was always a delight; even if the name of the wildflower was a mystery to me at the time. wildflowers through the British summer, I hope that their appreciation of what nature can create will be elevated, as mine was. It’s not only the bees and the butterflies that benefit from wildflowers; they have a therapeutic effect on all of us!